I took a solo trip to Boston in December 2012, and decided to rent a car and stay in Salem for an evening. I booked a room at the Hawthorne Hotel. When I arrived, I was given my room card, which was for room 615. I asked if the hotel was busy, and the girl told me I was the only person staying on the sixth floor that evening. When I returned to the hotel at about 11:00 pm after watching Monday night football at a nearby bar, I got in the elevator, and two girls asked me if I liked staying in a 'haunted hotel'. They asked me where I was staying, and I told them on the sixth floor. They told me I was crazy staying up there by myself. I heard of the reputation of the hotel by reading reviews before I left, but didn't think much of it. I fell asleep easy shortly after midnight. However, I was woken up at 5:52 am by three loud noises inside my room - they sounded like something plastic being dropped on the coffee table. They were loud, and definitely within my room - I am hard of hearing, and they jolted me upright. When I reached over to turn the bedside light on, my upper body was frozen with tingling waves of electricity for about 30 seconds - I couldn't move! My heart was beating like crazy, and the hairs were standing up on my neck - I thought I was having a heart attack. After struggling to try to turn on the light switch to no avail, I just slumped back onto the pillow, then got a horrible whiff of really bad body odor, which lasted about 30 seconds - then it completely disappeared! I stayed awake in the bed until 7:00, eyes wide open, barely moving a muscle. Nothing else happened during this time. I got up, threw on a hat, packed, and left very quickly. None of the above experiences have ever happened to me before. Here are three photos taken in the 6th floor hallway at 11:45 pm. All photos were taken within 3 seconds of each other. The middle photo shows an orb which is not present on the first or last photos, which debunks moisture on the lens. Feel free to comment on this, or to request for me to email you the pictures for your analysis. 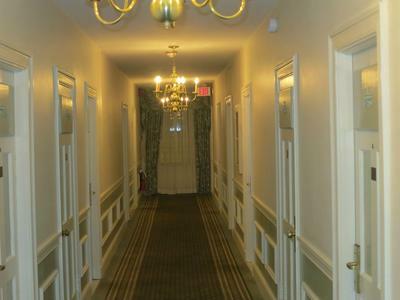 Comments for Bizarre Experience in the Hawthorne Hotel in Salem, Mass. I went to the Hawthorne Hotel with friends after visiting the old town of Salem (not the witch hype) on November 2, 2016. Someone I know had lunch there two weeks prior and told me it was so creepy she had anxiety throughout her meal. I did no research prior to going as it was a last-minute detour. After we ordered meals in the Tavern I excused myself for the restroom. The basement one looked closest so I went down. After washing up I decided to explore. The first conference room on my right made me feel like eyes were following me, so I continued to the room called "the library". I sat down in a nice upholstered chair at the end of a long room to see if I could feel anything. 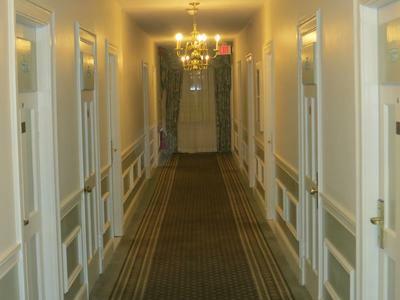 No kidding, I immediately heard footsteps at the far end of the carpeted room start walking toward me! As they got within a few feet I stated "No, don't touch me" and they stopped. I was unnerved, but growing up in an older and haunted house I am no stranger to such stuff. I got up to leave, when I placed my hand on the door, I felt a chill and the door would not budge. I said "well you are not allowed to stop me", and then the door swung easily open. After lunch my friends and I went together to the Library. We all felt a heaviness on our chests and chills in the Library by a wall vent, the window seats and the green curtain. While sitting on the window seats we saw, all of us, a negative like image of a man's head and shoulders appear on the mirrored column in the room. And as we watched, a child's hand print appeared. However, none of us could leave a hand or finger print. We tried to take photos, but the reflections and lights made it difficult. At least 5 of us can say we all saw it. Join in and write your own page! It's easy to do. How? 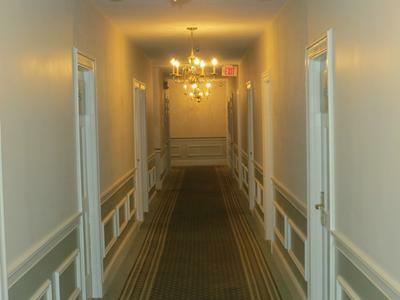 Simply click here to return to Haunted Hotels in the Northeast.